washing machine question. (KitchenAid model#622874) I suspect the water inlet valve is faulty since water is dripping when the machine is “off”. Where is the valve located? How do I access to replace? Yep, sounds like your water inlet valve can’t quite pinch it off anymore. 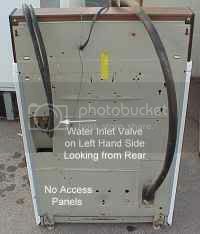 The valve is mounted to the washer’s rear bulkhead (that’s Navy talk for “wall” or “panel” — don’t let it throw you), as seen here to the right. Hey, don’t run off and start taking off the back panel like a kid opening a Christmas present– take a breath and read this short missive on how to disassemble your washer. You’ll be glad you did. As you probably suspected, the valve can no longer be trusted to control 40 to 60 psi of water pressure every day, all day long; you have to replace the valve. And, if you purchase the new valve here within the next five minutes, I’ll confer a special blessing upon you. Nolo contendere, e pluribus unum, my child. This entry was posted in Washer Repair on October 25, 2005 by Samurai Appliance Repair Man.